Air conditioners lose capacity with use. The coils become plugged, filters get dirty, belts slip and often there is a refrigerant leak. While comfort is lost, energy cost soars. A 20% increase in operating cost is not uncommon. You may not recognize this problem until comfort is lost and, by then, the extra dollars are gone. With oversized air-conditioning equipment, the recognition time is longer and dollar losses are greater. The solution to the problem is�get a complete tuneup. Here is what a complete tuneup accomplished with one commercial system when the outside temperatures (ODT) were in the range of 80-85 degrees F.
The capacity was restored 18% with a complete tuneup. A partial tuneup restored capacity only 5%. 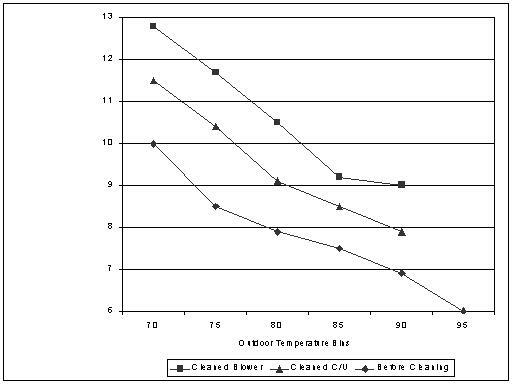 Figure 1 shows capacity curves before cleaning, with cleaned condensing unit (C/U) and with cleaned blower. Follow the dotted lines. Cleaning the condensing unit not only restored capacity 5%; it reduced actual energy consumption 10%. 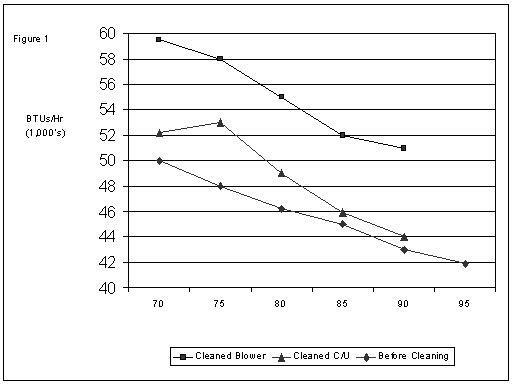 The additional restored capacity from cleaning the blower did not further reduce energy use. A complete tuneup outperformed a partial tuneup. Efficiency is expressed in Figure 2 as a performance factor (P/F) and is shown for before cleaning, for cleaned C/U and for cleaned blower. Follow the dotted lines. The P/F is the measured capacity divided by the measured watts of energy. The P/F values are 7.9, 9.2, and 10.3. The partial cleanup resulted in only 54% of the total increase in efficiency. For the same running time the partial tuneup reduced the utility bill by 14% and the complete tuneup reduced it by 24%. The compressor in the air conditioner described may have a shortened life. Some authorities say that the hot gas temperatures should be below 200 degrees F for extended life. A complete tuneup reduced the temperature from 208 to 195 degrees F.
Often thermostats are influenced by heat sources other than room temperature. When thermostats are located near table lamps in houses or offices, or receive direct sunlight during a portion of the day, or in the warm air discharge from an ice maker in a restaurant, air conditioners run longer than normal. Of course this increases energy use as well as erratic comfort cycles. You can shorten running time by raising the temperature setting on the thermostat. For example, the air conditioner ran 15% less when the thermostat was adjusted from 75 degrees to 77 degrees. Your influence on the thermostat can reduce energy bills significantly. The cost of the complete tuneup of this commercial unit was estimated at $405. Savings was calculated at $462 per year. Payback was less than one season. Tuneups are profitable. In most cases, they should be performed at least every two or three years, some even more often. Remember, without tuneups, a 3-ton air conditioner may perform like a 2 1/2-ton unit while you are paying the operating cost of a 3 1/2-ton unit. That�s not profitable, nor energy efficient. C. Check refrigerant charge after cleanup. D. Check control system for proper performance. Qualified service personnel should conduct the tuneup. You change the filters. Whether your air conditioner is in your home, office or business, air-conditioning tuneups are profitable. Juban's - Baton Rouge, La. Masson's - New Orleans, La. Catfish Cabin - Monroe, La. This publication was developed as a part of the Small Business Air Conditioning, Heating and Refrigeration Education Program funded with Oil Overcharge Monies provided by the Department of Natural Resources. Mention of trade names or commercial products does not constitute endorsement or recommendation for use. Pub. 2381 (5M) 6/94 Rep. Issued in furtherance of Cooperation Extension work, Acts of Congress of May 8 and June 20, 1914, in cooperation with the United States Department of Agriculture. Louisiana Cooperative Extension Service provides equal opportunities in programs and employment.